An enthralled zMAX Dragway crowd witnessed record-setting speeds and 11,000-horsepower competition in Friday's qualifying sessions for the NHRA Carolina Nationals, as Tommy Johnson Jr. shattered the Funny Car track elapsed-time record with a 3.876-second pass and John Force eclipsed the Funny Car track speed record with a scorching 331.04-mph run in a sun-drenched afternoon of time trials. Johnson bested Alexis DeJoria's previous mark by .058 seconds -- a significant amount for a Funny Car. 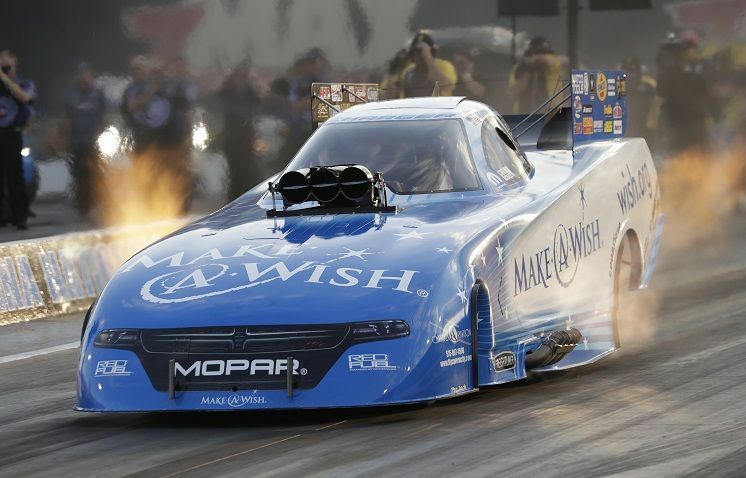 Force begins Saturday's qualifying sessions behind Johnson and Ron Capps, but with a speed record that topped Matt Hagan's 323.5-mph pass in April. "We went out in the first session and we weren't being shy. We smoked the tires," Johnson said. "I was aggravated. To go out and do what we did (after), it goes to show how much our team wants this in the Countdown. You have to be aggressive and go out and take this championship. We're really happy with our performance, but we're still shocked our time wasn't beaten." Doug Kalitta's 3.721-second, 325.77-mph run put the veteran driver first among Top Fuel competitors, while Jason Line (Pro Stock) and Jerry Savoie (Pro Stock Motorcycle) also secured the three bonus points that accompany the fastest Friday driver in each class. "When I was going down through there I was really hoping I'd be ahead of those guys and we were," Kalitta said. "Hats off to my guys. They do a great job. We're working really hard. It's exciting to be out here at Charlotte and we're really happy with having a good run today ... Getting low qualifier in the first race of the Countdown would be exciting. We'll try to take that momentum and use it." Line, from nearby Mooresville, North Carolina, jumped to the top spot in Pro Stock time trials with a 210.41-mph, 6.581-second pass that bested Vincent Nobile by .012 seconds and Shane Gray by .014 seconds. "It was a good run for us," Line said. "I think there's probably a little more left. That's the good news. I'm very happy. I can sleep well tonight. All in all, it was a very good day." Savoie opened his Countdown to the Championship efforts with the best possible result thanks to a 6.850-second, 195.19-mph pass. "We have a little bit left in us," Savoie said. "We'll find it. We've got some really fast cars out there. You've just got to bring your best and keep on working." The last two rounds of qualifying begin on Saturday at 12:45 and 3 p.m. Final eliminations begin at noon on Sunday. To purchase tickets and camping to the NHRA Carolina Nationals, visit www.zmaxdragway.com or call 1-800-455-FANS (3267). Kids 13 and under get in FREE with the purchase of an adult ticket. Every ticket is a pit pass, so fans can walk through the pits and see their favorite drivers and teams as they prepare to take to the track. 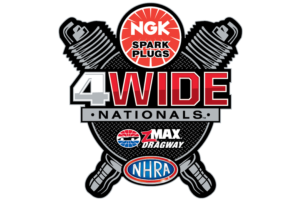 Connect with zMAX Dragway and stay up to speed with all the happenings at the Bellagio of drag strips on Facebook, Twitter or on Charlotte Motor Speedway's mobile app. Top Fuel -- 1. Doug Kalitta, 3.721 seconds, 325.77 mph; 2. Brittany Force, 3.729, 324.67; 3. Tony Schumacher, 3.730, 325.14; 4. Steve Torrence, 3.732, 323.27; 5. Shawn Langdon, 3.741, 328.14; 6. J.R. Todd, 3.741, 325.37; 7. Antron Brown, 3.742, 317.94; 8. Richie Crampton, 3.744, 320.51; 9. Clay Millican, 3.767, 319.82; 10. Pat Dakin, 3.791, 320.89; 11. Leah Pritchett, 3.809, 317.27; 12. Wayne Newby, 3.815, 318.39. Not Qualified: 13. Scott Palmer, 3.895, 315.78; 14. Ike Maier, 4.102, 277.43; 15. Paul Noakes, 4.461, 209.69; 16. Cameron Ferre, 4.873, 150.15; 17. Terry McMillen, 5.037, 146.77. Funny Car -- 1. Tommy Johnson Jr., Dodge Charger, 3.876, 323.43; 2. Ron Capps, Charger, 3.878, 324.20; 3. John Force, Chevy Camaro, 3.881, 331.04; 4. Alexis DeJoria, Toyota Camry, 3.887, 324.67; 5. Jack Beckman, Charger, 3.904, 327.82; 6. Robert Hight, Camaro, 3.912, 323.66; 7. Tim Wilkerson, Ford Mustang, 3.921, 321.50; 8. Courtney Force, Camaro, 3.939, 321.50; 9. Matt Hagan, Charger, 3.940, 323.81; 10. Cruz Pedregon, Camry, 3.940, 318.54; 11. Chad Head, Camry, 3.956, 311.77; 12. Del Worsham, Camry, 3.963, 318.99. Not Qualified: 13. Dave Richards, 4.093, 309.56; 14. John Bojec, 4.179, 234.57; 15. John Hale, 4.599, 194.30. Pro Stock -- 1. Jason Line, Chevy Camaro, 6.581, 210.41; 2. Vincent Nobile, Camaro, 6.593, 210.28; 3. Shane Gray, Camaro, 6.595, 210.18; 4. Alex Laughlin, Camaro, 6.597, 210.44; 5. Allen Johnson, Dodge Dart, 6.603, 209.01; 6. Bo Butner, Camaro, 6.606, 209.88; 7. Greg Anderson, Camaro, 6.609, 210.50; 8. Chris McGaha, Camaro, 6.641, 209.10; 9. Matt Hartford, Camaro, 6.641, 208.36; 10. Drew Skillman, Camaro, 6.646, 209.79; 11. Jeg Coughlin, Dart, 6.651, 208.17; 12. Kenny Delco, Camaro, 6.659, 207.24. Not Qualified: 13. Erica Enders, 6.678, 207.56; 14. Curt Steinbach, 6.699, 206.04; 15. Shane Tucker, 6.777, 206.64; 16. Alan Prusiensky, 6.801, 203.89; 17. John Gaydosh Jr, 7.362, 168.01. Pro Stock Motorcycle -- 1. Jerry Savoie, Suzuki, 6.850, 195.19; 2. Angelle Sampey, Buell, 6.861, 195.82; 3. Chip Ellis, Buell, 6.864, 195.03; 4. LE Tonglet, Suzuki, 6.867, 195.96; 5. Andrew Hines, Harley-Davidson, 6.869, 194.02; 6. Jim Underdahl, Suzuki, 6.871, 194.83; 7. Hector Arana Jr, Buell, 6.876, 194.86; 8. Matt Smith, Victory, 6.884, 194.21; 9. Eddie Krawiec, Harley-Davidson, 6.892, 192.82; 10. Hector Arana, Buell, 6.894, 195.73; 11. Melissa Surber, Buell, 6.905, 192.58; 12. Cory Reed, Buell, 6.937, 192.66. Not Qualified: 13. Karen Stoffer, 6.959, 192.17; 14. Mike Berry, 6.980, 191.10; 15. Angie Smith, 6.986, 189.07; 16. Mark Paquette, 7.014, 190.03; 17. Shawn Gann, 7.027, 191.92; 18. Steve Johnson, 7.076, 191.08; 19. David Hope, 7.203, 186.02; 20. Lance Bonham, 7.227, 180.07; 21. Brian Bognuda, 7.261, 180.50; 22. Chaz Kennedy, 7.351, 185.03.